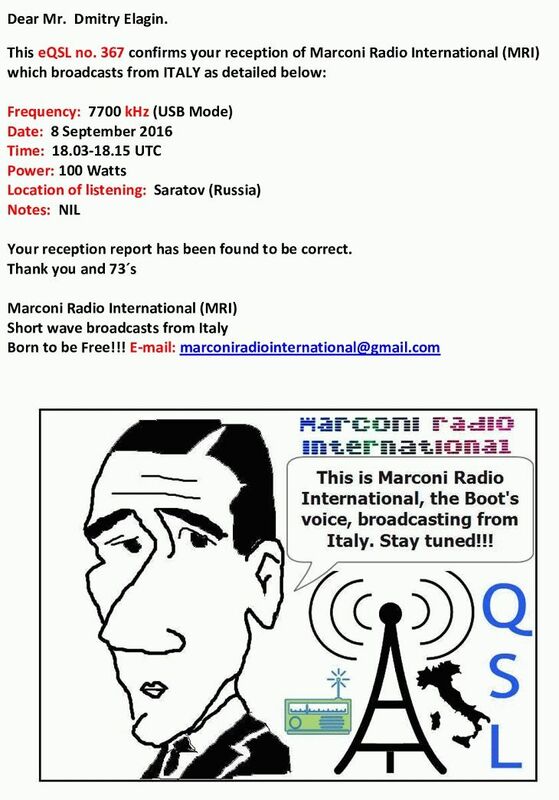 We are a small free radio station broadcasting from Italy which, after 15 years of dormancy, returned back to the airwaves on 15 August 2015. MRI began its short wave transmissions on 4 January 1986 and this year celebrated its 30th anniversary as well as one year on the air since it resumed broadcasting quite regularly. 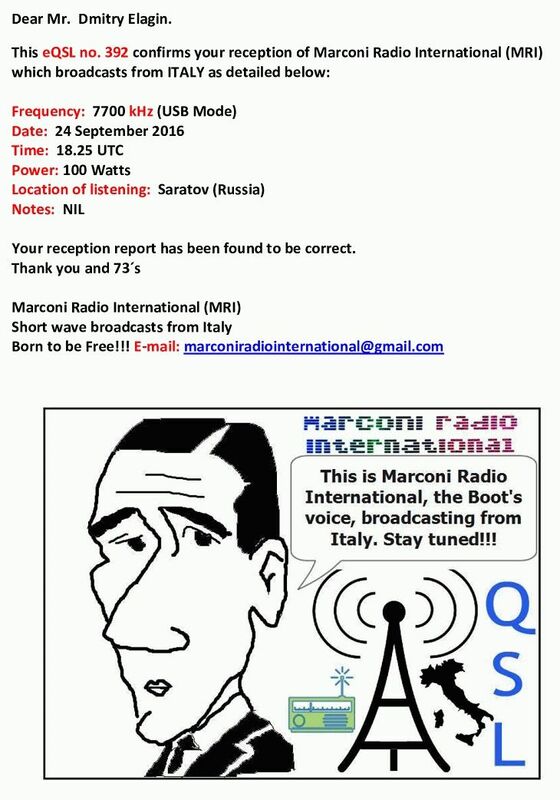 Until now, reception reports, found to be fully correct, have been received from listeners in Austria, Belgium, Bulgaria, Canada, Czech Republic, Denmark, Finland, France, Germany, Greece, (Northern) Ireland, Hungary, Italy, Japan, Latvia, The Netherlands, Norway, Poland, Romania, Russia, Spain, Sweden, Switzerland, Ukraine, United Kingdom and USA. It should be also mentioned that the station was also logged by SWLs in Portugal. 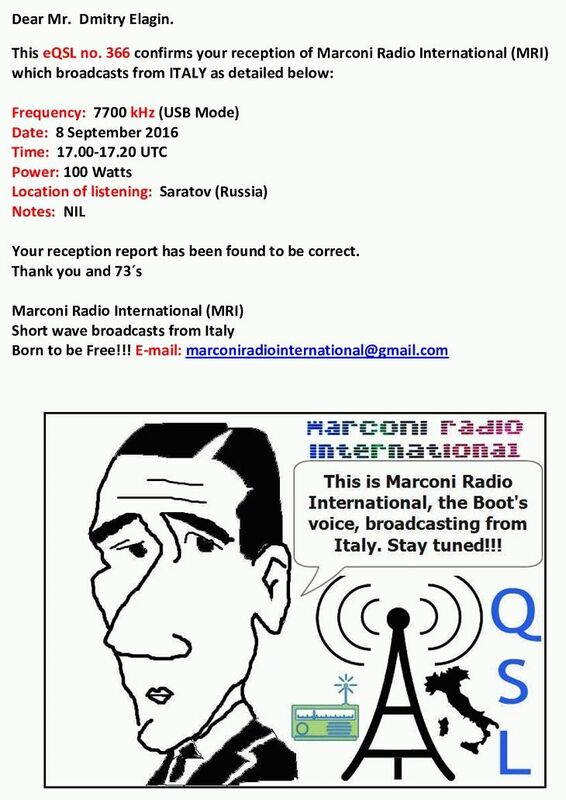 In December 2016 we are on the air as follows: On Saturdays and/or Sundays, from 1300 to 1600 UTC on 7700 kHz (USB mode), with a power of 100 watts. Please be advised that our schedule is liable to change and as from November of this year, our weekly broadcasts on Tuesdays have been cancelled. However, the next transmission of MRI are scheduled on: 24 December 2016, 1300-1600 UTC; and on 25 December 2016, 0800-1100 UTC, both on 7700 kHz (USB mode). Currently, the addition of a power amplifier, able to put out 500 watts, is under way. At the same time a new antenna is in the planning stage. We are also studying the feasibility of sending in our printed QSL cards to a larger number of listeners by adopting a new policy on verifying reception reports (At this stage only a few lucky listeners are acknowledged with our printed QSL). We would be glad to receive further reception reports from you again in the future. Merry Christmas and a Happy New Year!